Duncan, Adam and Kate, and their 30 foot Trans flag that was used in the Pride Cymru Parade this year! My name is Kay R. Dennis (they/them pronouns), I identify as trans nonbinary, and I’m a third year on the Performance and Media course! I’m also your Gender Identity Officer for 2018-19, and I’ve been working to make trans and nonbinary issues more visible within the SU this term. Over this past term, I’ve been building on the work I started last year with the University, and on Trans Day of Remembrance (20th November), we released the Trans Equality Policy Statement, along with the Trans Allies Programme, and some Trans Awareness Training for Staff. This year, there has been an almost overwhelming barrage of anti-trans sentiment within the media, from transphobic activists, but also from the general public who are often misinformed around issues surrounding trans and non-binary identities. In response to this, in October, I responded on behalf of USWSU to the Government consultation for the Reform of the Gender Recognition Act 2004. I also attended the Welsh Government Equalities Office Round Table in conjunction with Youth Cymru and USWSU. 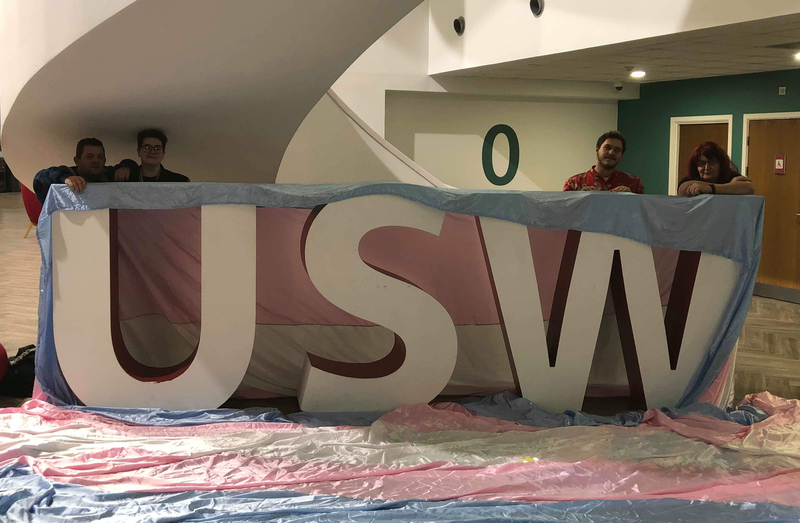 Through these, I was able to state that USWSU does not tolerate transphobia of any kind, but also express and reinforce the message of solidarity to our trans and nonbinary siblings, within the SU as well as the wider community. This year, we also had a day of events to mark Trans Day of Remembrance (TDOR). We led with a coffee morning, full of crafting and contemplation, where students were joined by members of staff from the University and the SU Exec Officers. We raised the Trans flag to half mast at 11am, and observed a two minutes silence to honour those we have lost to transphobic violence or suicide in the past year. For the evening vigil, we were joined by Rhi Kemp (they/them) from the USW Staff team, as well as Adam Smith (he/him) from Pride Cymru, and Kate Hutchinson (she/her) from Diversity Role Models, Wipe Out Transphobia and Pride Cymru. We were joined by Sexual Orientation Officer Duncan Bell (he/him), as well as fellow students and members of the public. I endeavour to continue the progress we have made over the past two years in terms of trans and nonbinary rights and awareness, as well as encouraging the work of the Trans Ally scheme and work on the University’s part.